Although Posner does not posit how much active management is necessary to make prices fair, the amount is likely far less than what we currently observe in markets. For example, imagine you are having a garage sale after cleaning out the attic of a deceased relative. Among the many artifacts is an original Van Gogh painting. Since you are unaware of its origin and real value, you set the price at $10. An art connoisseur attending the sale would surely pay $10—albeit quietly—and profit from the information asymmetry between buyer and seller. However, if another art connoisseur shows up at the sale before the deal is done, the price is unlikely to remain at $10. A bidding war between just two informed buyers may drive the price to a fair market value. If you prefer theory over anecdote, consider the paradox identified by Sanford Grossman and Nobel laureate Joseph Stiglitz. They propose that the equilibrium outcome is when the marginal cost of searching for mispriced securities equals the marginal profit associated with exploiting pricing errors. However, if assets invested in index funds increase to the point where mispricing becomes easy to identify and profit from, active investors would reenter the market until the marginal benefit of active investing once again does not exceed the marginal cost. This theory suggests that the performance of active fund managers offers one barometer for how well markets are pricing securities. If there is insufficient price discovery due to the increase in passive management, one possible outcome is that many active mutual fund managers would outperform benchmarks due to plentiful mispricing opportunities. So, what does the research tell us? The line in Exhibit 1 shows the percentage of passively invested equity mutual fund assets in the US. The bars depict the percentage of active managers that survived and beat an index benchmark over rolling three-year periods from 2004–2016. Although indexed assets have increased steadily in recent years, this growth apparently has not provided more mispricing opportunities for active managers to harvest the supposed low-hanging fruit, as shown by their consistently low levels of outperformance as a group. 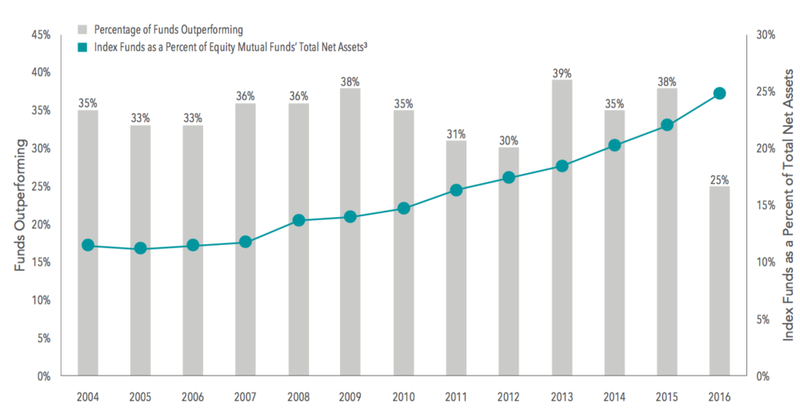 Equity mutual fund outperformance percentages are shown for the rolling three-year periods ending December 31 of each year, 2004 through 2016. Each sample includes equity funds available at the beginning of the three-year period. Outperforming funds are those that survived and outperformed their respective Morningstar category benchmark over the period. Sources: US-domiciled open-end mutual fund data is from Morningstar and Center for Research in Security Prices (CRSP) from the University of Chicago. Past performance is no guarantee of future results. For more methodology details, see Appendix and the Mutual Fund Landscape Brochure or contact your investment advisor for more information. It’s also unclear whether higher asset flows to index funds would cause distortions in prices because passive investment strategies function as price takers. Exhibit 2 shows that, although the S&P 500 Index returned 21.83% in 2017, Amazon rose 55.96% while General Electric returned –42.92% for the year. Yet both stocks have a similar market capitalization and would have similar weights in traditional market cap-weighted indices. If the flow of assets into index funds were driving prices, you might expect the constituents of the index to have returns similar to each other and the overall return of the index. Yet, the individual constituents of the index had radically divergent returns, ranging from +133.70% to –84.00%. Investors who actively trade based on new information, expectations, tastes, preferences, and other considerations are still setting prices. The competition and voluntary exchange among those market participants are the mechanisms that make those prices fair. The index boogeyman may not be real, but he’s been part of folklore for a long time—and sounding the alarm on index funds during a sustained period of rising stock prices is hardly a new phenomenon. The view that index funds distort prices was promoted decades ago following a market surge in the ‘90s. In that regard, the more things change, the more they stay the same.